Over the past five years, Leeds and Sheffield have seen a lot of development - However, Leeds has made the transformation into a ‘retail destination’ faster than Sheffield, which has kept a more ‘traditional centre’. The opening of the Victoria Gate in Leeds last October, a £165 million development in the heart of the city, attracted even more visitors to Leeds creating a ‘Premium Zone’ in West Yorkshire with the opening of more luxury shops. This May, Lonely Planet picked Leeds as number five in its “Top European destinations” in 2017 and was praised for its “urban regeneration”, “flourishing cultural scene”, “thriving nightlife” (of course) and “reputation for food and craft beer”. However, Sheffield shouldn’t be underestimated; plans for the year ahead look very promising with an increase in investment in making Sheffield a greener city and the opening of more retailers and leisure operators such as TAG Heuer, Flannels, Barburrito and IKEA (expecting to create up to 700 jobs)! 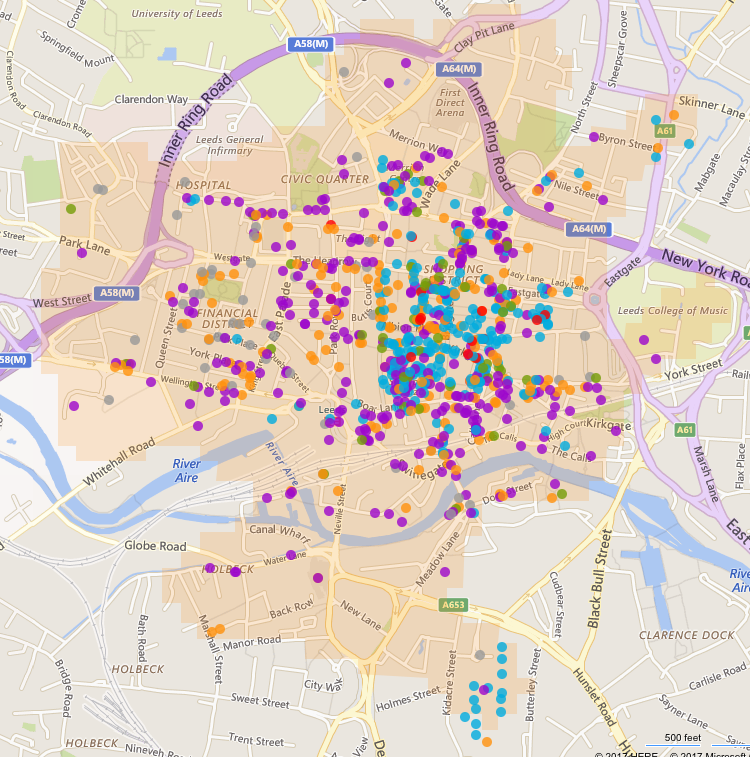 As an ex-student of Leeds and a huge fan of this area of the country, I decided to dig deeper to find out more about both Yorkshire cities by using LDC’s online location intelligence platform, LDO. I discovered that in both cities, some of the top openings were also the top closures, which showed a high level of churn. More shops under the Cafes & Fast Food, Hairdressing & Health Beauty salons categories are opening in both Leeds and Sheffield. More Tobacco, Vaping shops and Newsagents are opening in Sheffield, while more Bars, Pubs & Clubs are opening in Leeds. In the last 12 months, Leeds has seen 118 openings and 93 closures whereas Sheffield saw more closures (-63) than openings (+37). Sheffield’s Leisure vacancy rate (8.1%) is lower than Leeds (10.6%) but equal to the GB average. However, Leeds beats Sheffield when it comes to Retail and has a Retail Vacancy lower than Sheffield - yet both substantially higher vacancy rates than the GB average of 12.0%. The high vacancy rate in Sheffield could be explained by the fact that Sheffield’s main Retail destination is Meadowhall which is located outside of the town centre. 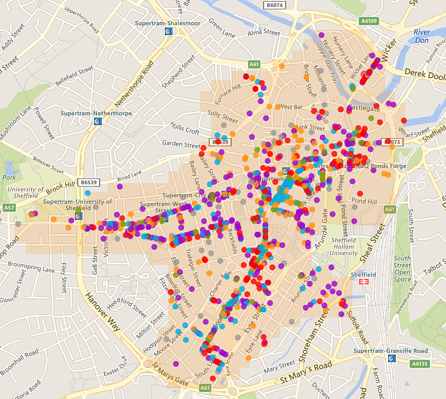 Whereas Leeds' retail activity revolves more around the city centre. Property firm British Land, which co-owns Sheffield’s Meadowhall Shopping Centre recently invested £23m in improving the retail environment and has plans for a £300m Leisure extension for 2018. British Land’s chief executive Chris Grigg said to the Yorkshire Post: “Our plans envisage a multi-level leisure hall with dining and entertainment options alongside high quality internal and external spaces for events and community use, including new restaurants, a new cinema, cafe court and gym.” Going forward we’ll be able to monitor how this impacts the Leisure vacancy rate in Sheffield town centre and see if any major Leisure operators relocate to this new space. In the two maps below we can see where the concentration of certain categories of stores are. For example, we can see that in Map 1, representing Leeds town centre, we have a lot of blue dots in the centre, meaning that this is where most Comparison retailers are, whereas in Sheffield, they are much more spread out. I’ve also had a look at the historical data, going back to 2012. Leeds and Sheffield both saw an increase in Leisure over the past 5 years and a drop in Comparison retail (finished goods such as books, clothing etc). This is probably due to the fact that consumers would rather spend money on ‘experiences’ such as going out for drinks / dinner followed by movies or going to concerts and food festivals rather than traditional shopping for entertainment. It’s then a challenge for retailers to create experiences within their stores and to keep up with the increasing pressure to stay up-to-date with the latest technology and trends more than ever whether it’s in-store or online. Whilst both Leeds and Sheffield have benefited from major development over the past five years, they have managed to retain their own identities, with their own attraction points. Sheffield still has more independents than Leeds, which makes it a more ‘traditional centre’ and is still famous for manufacturing companies. Leeds on the other hand, is no longer only defined by its ‘industrial past’ but is also famous for it’s cultural hub and nightlife. Leeds and Sheffield are both resilient cities with significant and yet different assets, strengths and capabilities. Both cities are aiming for the same thing: to be a fair, welcoming, innovative, sustainable city with a prosperous economy. I’m looking forward to seeing where both cities will be in a year!